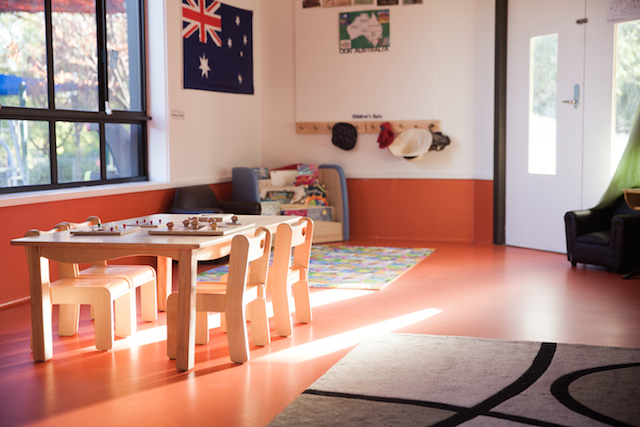 At Reid Early Childhood Centre, we recognise the importance of families in a child’s life and aim to develop positive, constructive relationships between parents and educators. We place importance on settling both a child and their family into care; whether commencing at the centre for the first time or transitioning from one room to the next, our emphasis remains on developing a sense of belonging. We provide a comfortable environment where parents are encouraged and welcome to spend time at the centre. Our Nursery Room serves as a ‘home away from home’ for children, with trained educators that are experienced and sensitive to the individual schedules and needs of infants. A small group size allows young children to have more one on one time with educators, making connections and developing caring relationships. In our Tiny Toddler Room, trained educators focus on providing a stimulating environment as children are beginning to meet new challenges and develop their emerging autonomy. In our Junior Preschool room, highly trained educators provide a fun and stimulating learning environment which is aimed at enhancing all areas of development. Children are offered play experiences based on individual interests and are given opportunities to develop their independence and creativity through open ended resources. Our Preschool Room focuses on providing stimulating learning experiences and environments where children will be challenged, engaged and encouraged to investigate and explore the world around them.